There are 32 miles of shoreline in Galveston. Many of the beaches are terrific for running, featuring firm, packed sand. Below are some of our recommended beaches for running. Note that beach running quality can be situational, depending on season, weather, and tides. Tide chart. Beach Along Seawall Blvd. This beach is OK for running, but there are numerous jetties and piers. The sidewalk above/along the beach, Seawall Urban Park, runs for 10 miles. Beach West of Seawall. There is some decent running on the beach west of the Seawall, notably in Galveston Island State Park and Jamaica Beach just west of there. East Beach/Stewart Beach. It’s about 3 miles of continuous beach from Stewart Beach (starts at intersection of Broadway Ave.) to East Beach, where there’s a free parking lot at the eastern edge of the island. This is among the wider, flatter, and more continuous sections of beach for running in Galveston. 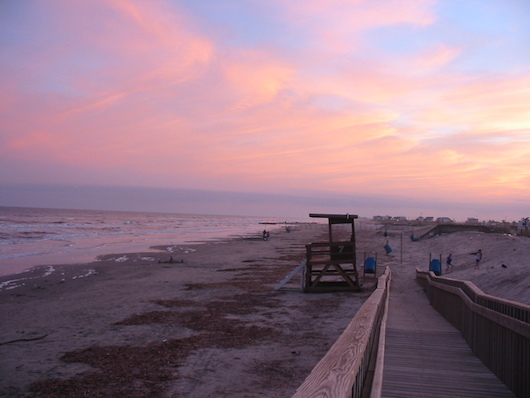 East Beach is the most scenic beach in Galveston. San Luis Pass Beach. Located at the western tip of the island, this remote beach goes for several miles east and is good for running. There is parking here. Note: San Luis Pass Rd. and the causeway to the mainland are NOT runnable – more of a highway, no sidewalk. Bolivar Peninsula. For some wonderful beach running, hop a ferry over to Bolivar Peninsula and enjoy running on 27 miles of beach shoreline. This is a long, continuous beach, very pretty, and generally features firm, packed sand. The ferry runs very regularly and is a quick trip. Ferry info.